Beware the deadly menace: the Imperial II-class Star Destroyer lurking with turbolasers and ion cannons at the ready! Using the official digital files from the Lucasfilm archives, QMx has crafted a 1:30000 scale replica of the ship that captured Princess Leia's Blockade Runner in the opening moments of Star Wars Episode IV: A New Hope. Cast in a solid steel alloy, this highly detailed model is just 2-inches long and comes equipped with a key ring, ready to dominate star systems - or take you to the store. 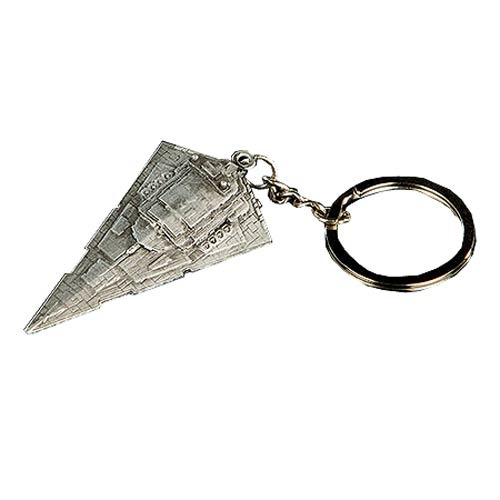 The Star Wars Star Destroyer Replica Key Chain is the latest addition to QMx's line of collectible metal ships that includes such bestsellers as the Firefly, Viper II, and Enterprise D key chains. Ages 14 and up.